I wanted to make my own wine. Not in the move-to-Napa-and-start-my-own-label kind of way. What I wanted was an abundant source of straightforward table wine to drink with dinner without having to go to a wine shop for a good bottle. 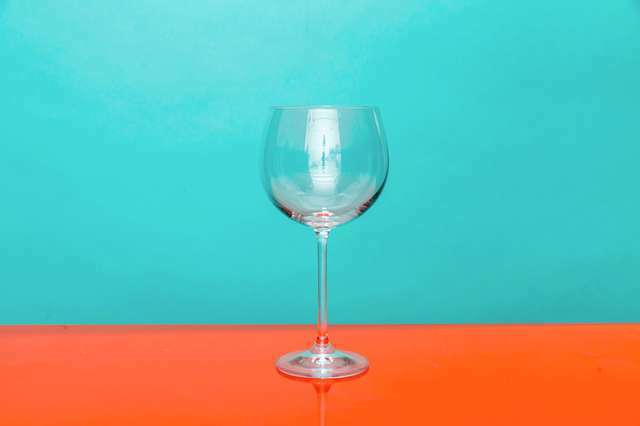 For me, the desire to make wine at home is driven by a sense of self-sufficiency compounded with the kind of cynicism that can develop during a career in the wine business. I’ve poured endless cheap malbec working at an airport wine bar, studied wine in France, sold to restaurants and retailers for an importer, and spent the middle part of my 20s as a salesperson at one of the biggest wine stores in NYC. I really care about wine, and for the most part fretting over details like temperature, glassware, and pairings is a pleasure and a hobby. But there are times when I don’t want my evening plans to revolve around how to best exalt a luxury beverage, and that’s when I thought about taking things into my own hands. Making wine at home is very different from say, recreating your favorite restaurant dish at home -- it's way more complex. Unless you make wine for a living, wine is almost always something you have to buy. My first resource was Making Table Wine at Home, a booklet published in the 1980s by the Viticulture and Enology department at UC Davis. It plainly lays out what is required to turn grapes into wine and made me realize this endeavor wasn’t impossible or foolish at all. What brought me to Welch’s was convenience. I wanted to make wine now, not at harvest time. Beyond that, I wasn’t ready to invest an extra $100 in a rudimentary grape crusher, a large piece of equipment that I’d have to find some place to store in my Brooklyn rental. And on the subject of cost, two cans of Welch’s only set me back $6. What brought me to Welch’s was convenience. I wanted to make wine now, not at harvest time. According to my research, you can actually do this to any of the frozen fruit juice concentrates -- any juice will ferment given the right conditions -- but just because you can ferment it doesn't mean you should. Apple, for example, can reliably produce a palatable cider, while OJ turns into a dreadful brew. The basic principle of wine is that it is only as good as the grapes used to make it. That’s why so much of learning about the beverage is devoted to climate, geography, and farming practices. 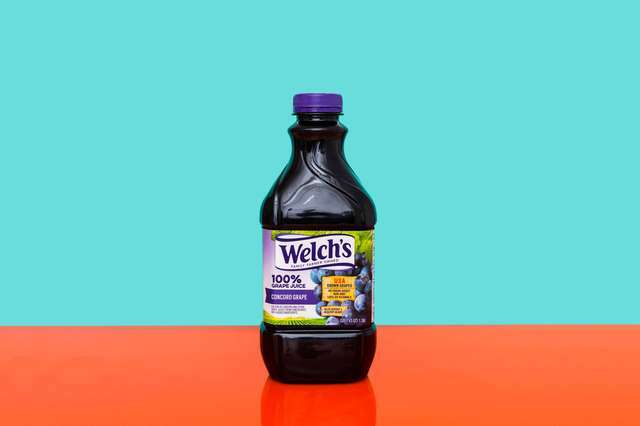 But what about a product like Welch’s, perfect in its own stabilized way? The question wasn’t if it was capable of making wine, but if it could be likable. I reasoned that Welch’s could make a fun tasting drink, if not the table wine of my dreams. Armed with a popular recipe, I headed to Bitter & Esters, my local homebrewing shop. The employees, used to the experiments from their regular clientele, seemed unfazed by my project, and helped me select the absolute minimum amount of hardware required for the project. I left with a 1-gallon glass jug; yeast; yeast nutrient, to keep the fermentation from getting stuck; pectic enzyme, which keeps the wine from going cloudy; an airlock for the jug; a funnel; sanitizing solution; a hydrometer, to measure sugar and alcohol; and a beaker, all for just under $50. I need to make a disclosure: I’ve made wine before. I worked at a winery in France for six months and have done everything you could possibly do from nurturing vines to stomping on grapes. It in no way gave me an advantage here. The only time I remotely recalled that experience was when I had to clean my recently purchased equipment. Raw material aside, sanitizing is crucial to the success of any homebrewing project. 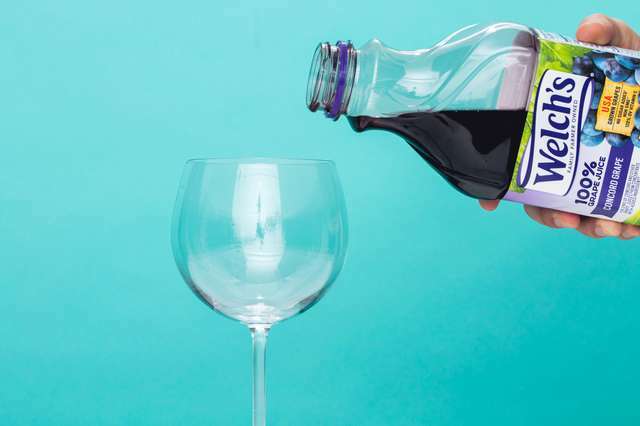 You sanitize anything that will come in contact with your future booze: the jug, the funnel, the utensil for stirring, thus protecting yourself from the potentially unpalatable result of rogue bacteria spoiling your work. This recipe is to winemaking as the Easy-Bake Oven is to making elegant French pastries. In my freshly sanitized kitchen, I started to follow the recipe by dissolving sugar in water and adding the thawed concentrate, then fortifying it with the yeast nutrient and a dash of pectic enzyme. This recipe is to winemaking as the Easy-Bake Oven is to making elegant French pastries. It does away with the vintage reports and soil composition and condenses the magic of brewing a drink beloved by humanity for millenia into a process that’s only a little harder than making a dump cake. With little more than a couple cans of purple stuff stirred into some sugar plus a little chemical magic, you too can harness the creative power of a winemaker. The wine I was making was closer to tightly controlled, cheap industrial bottles than anything I’m used to drinking, but that doesn’t mean making it wasn’t exciting. For the first 24 hours I marveled as the potion blew large mucus-y bubbles and vigorous foam into the headspace of the jug placed in the middle of my dining table like a centerpiece. By the following week, the fermentation was tamer, retreating to a compact purple crema that eventually dissipated while the layer of sediment at the bottom of the jug grew thicker. On it went, fizzing undisturbed for over a month. After the bubbles died down completely, I let it sit a few more weeks, waiting for the dead yeast cells to fall out of suspension so that the wine would be clear before siphoning it into a new, sanitized, jug. At that point, I could have pursued the traditional route of storing the wine in sealed 750-milliliter glass bottles and letting it age for a year to mellow the final product, but as the impulsive winemaker that I am, I decided to serve it right away. After 45 days, I poured the first drops of wine into a glass and sniffed. The first thing I noticed was an acidic prickle that scared me into thinking I wasn’t fastidious enough when sanitizing and something nasty had infected the batch. Following a vigorous swirl, I was relieved to observe it had disappeared, leading me to believe it was just residual CO2 left over from fermentation. Other than that, my wine was technically sound. Ruby red in color and transparent, it totally looked the part. Casual wine drinks wouldn't be able to tell that it wasn't poured from a standard bottle of wine on looks alone. Although it only hit 10% ABV (most dry wines fall between 11-15%), it wasn’t sweet on the palate and even had some acidity going on. At first I was delighted to have made it, but confronted with the rest of the glass, I realized that I didn’t really want to finish it. I put the question to my friends, almost all of whom demurred about their ability to assess wine, before attempting judgment. Most were impressed by the act of winemaking itself, but the wine wasn’t exactly a hit. The most common response was along the lines of, “I wouldn’t return this if it was served to me at a restaurant,” though for most people that usually takes a catastrophe. It at least seemed clear to them that this wine was teetering on the edge of quality. There is a reason why no serious wine drinker would take this seriously. It wasn’t the fact that I used a frozen concentrate, it’s the foxiness. Foxy is the term for the strong quality of American grapes like concord, a scent and taste resembling… you guessed it, fox. It’s also been compared to the smell of a fur coat. More generally, it’s a musky note. This is a quality unrelated to the controversial “barnyard” note that shows up in certain wines, which tastes more like how horses smell. Foxiness is a hallmark of grapes from the species V. labrusca, whereas all of the grapes that get turned into what is classified as fine wine are V. vinifera. That distinctive flavor is part of what makes concord grape juice so pungent and delicious whether as juice, or jellied and served with peanut butter on bread, but it is quite a funny flavor in wine. Manischewitz makes a ubiquitous kosher wine from concord grapes. Known for being cloyingly sweet and packing the aforementioned grapey funk, its popularity has more to do with tradition than taste. Mulling the process over while staring at the wine left in my glass, I decided to embrace the juice and threw in a handful of ice cubes. It seemed silly at first but the change was marked and immediate, taking away any harshness and adding some necessary levity to my drink. It was just too plain for me. While I can’t recommend that anyone walk in my footsteps strictly for the resulting wine, I’m optimistic about the results I could get using different grapes under the same circumstances and I’d like to make another batch by sourcing fresh juice from a local vineyard. My Welch’s wine may not have been the delightful little house wine I’d wished for, but it was a good start to figuring out how to get there. Tammie Teclemariam is a drinks writer and aspiring spirits vlogger. She is working on a series for public access television based on her Instagram stories. Follow her on Twitter.